Robert John Whittaker is an Australian mixed martial artist who was born on New Zealand. He is the welterweight winner of The Ultimate Fighter: Smashes. Whittaker fights in the middleweight division in the UFC, where he is the interim champion. He has a black belt in Karate, Hapkido and BJJ. He made his MMA debut in ’09 and won his first fight by TKO in the first round. He won six straight fights in Cage Fighting Championships, four of them by finish. His first career loss came against Hoon Kim who submitted Whittaker with a triangle. He won two in a row before his second loss, against Jesse Juarez. Whittaker was a part of a 8-man team representing Australia against a team from the UK. In his first fight of the season he knocked out Luke Newman in 19 seconds. He got $25.000 and “Knockout of the Season” for his win. His next fight was about a minute longer, when he knocked out teammate Xavier Lucas and punched his ticket to the live finale, at UFC on FX: Sotiropoulos vs. Pearson. He fought Brad Scott in the finals and the fight lasted for three rounds. Whittaker eventually won the decision. His next fight was against Colton Smith which he won, before his first loss in the UFC against Court McGee by decision. He followed up the loss with another loss against the talented Stephen “Wonderboy” Thompson, Whittaker lost to Thompson by first round TKO. His last fight at welterweight was a win against Mike Rhodes, after the fight he moved up to middleweight where he faced Clint Hester. Whittaker won by TKO in the second round. The back-and-forth fight got awarded “Fight of the Night”. Whittaker continued the win streak and beat highly ranked Derek Brunson, Uriah Hall and Brad Tavares. His toughest test thus far in his career was Ronaldo “Jacare” Souza, at the time ranked #2 in the world. Whittaker shocked the world when he finished “Jacare” in the first round via head kick and punches. Injuries prevented the champ Michael “The Count” Bisping to defend his title, so Whittaker got the chance to face Yoel “Soldier of God” Romero for the interim title. The two fought for the interim middleweight championship of the world at UFC 213: Romero vs. Whittaker which was originally supposed to be headlined by Amanda Nunes vs. Valentina Shevchenko but illness forced Nunes out of the bout. Romero landed vicious front kicks to the knee of Whittaker, despite the damage to his knee Whittaker was able to win a convincing decision. As interim champion Robert Whittaker is supposed to fight Michael Bisping. 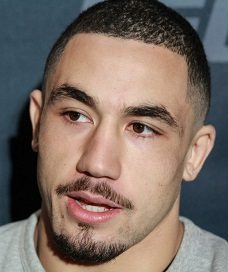 Whittaker’s injury hasn’t healed yet so no fight has been scheduled for “Bobby Knuckles”.